This is an Origami Magic Ball. Base paper starts at 8 feet x 16 feet. Basic folds are all water bombs. Scrunching is the hard part. 128 square feet of paper! I am first time hearing about the Largest Origami magic ball challenge and its really very interesting. Thank you so much for the interesting article. Great creative work, I am here to appreciate your patience and talent on working with this. You have a good skill. I like this very much..
To all of the kind people that have responded to my challenge. I thank you all. Keep those pictures coming, i am lucky to have anyone check out my work. Woah, how did you get origami paper that big? Thank you for bringing this to the origami world, as you inspired me to make a lifesize magic ball, and lifesize PHiZZ unit ball! I am currently working on making 4800 PHiZZ units, and I'm just going to see where I can go with that! Thank you for your contribution and inspiration to the origami world! I give this 5 stars because I marvel at origami results and I believe in the special ability to take an ordinary sheet of paper and transform it into something absolutely marvelous. To have such a talent you must be very blessed. Continue to create incredible projects, and your future awaits brighter than ever ahead if you. It is amazing to see such an amazing creation made only out of paper! I would not have the skills to create this masterpiece! Congratulations! WOW that is very huge! I can't believe that some one would do that! It like impossible! That must of took forever!! I would like to make a magic ball. But it look pretty hard when I watch videos. Also nice job! That is amazing!!! Can you make me one just kidding. i could not get a single piece that big. so i i did tape 128 squares together. I would like one big sheet. I do have a large origami firework on youtube. How did you make the paper that big? Meaning, did you tape sheets of paper together? 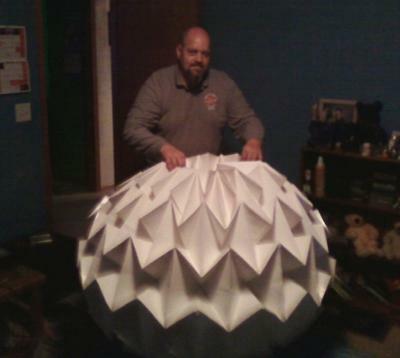 I've always wanted to make magic balls and PHiZZ unit creations with huge paper! Have you made any other origami creations that size?